Must be 18 years, live within 120 miles, photo ID, appointment necessary. Subject to availability.Customer responsible for any tax. Winners ieligible to win again for 1000 days. Where is Auto Alley located? a. Auto Alley is a member in good standing with The Automotive Service Association. b. Auto Alley has been ranked among the Top 10 Repair Facilities in the country. c. Auto Alley concentrates on quality not quantity with one location to serve you better. d. The owners name really is Alley. No his first name isn't Auto, that would be Otto if he were German, it's Kenny; he doesn't even like German cars. What kind of Automotive repairs does Auto Alley specialize in? 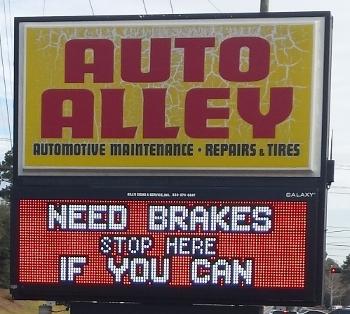 Auto Alley was founded in what year, and continues to have only one location to serve you better? Which of these devises at Auto Alley do you think needs to be used on your car the most? a. Oscilloscope b. 3 different computer interface machines c. The best fuel injector cleaning system in the industry called a Motor Vac Machine d. A DVD library that is updated every three months with wiring diagrams, service bulletins, and the latest repair techniques. e. Whoa, sounds like rocket science to me, I'm glad Auto Alley has all this stuff and the technitians that know how to use it.